Once upon a time, an ancient city in China was named Lion City because Five Lion Mountain loomed large behind it. 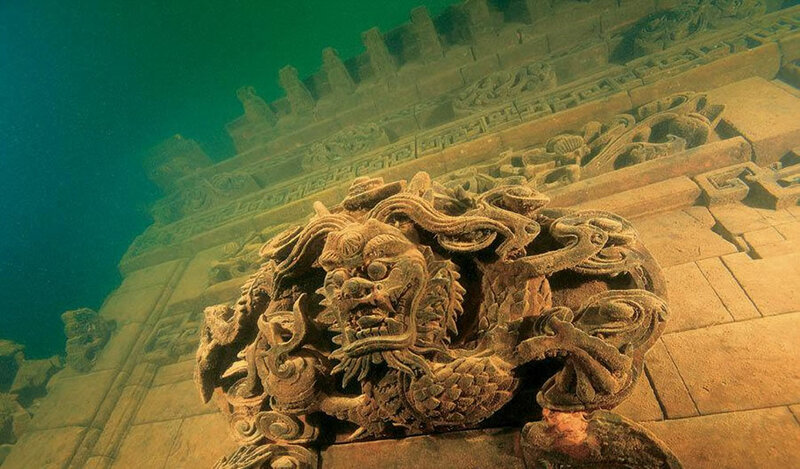 The city, also known as Shi Cheng, has been buried beneath the water for 53 years. Like the lost Incan City of Machu Picchu was ‘rediscovered,’ so was this lost underwater city that had been founded about 1,300 years ago. Lion City is now located about 85 – 131 feet (26-40 meters) beneath the gorgeous Thousand Island Lake (Qiandao Lake). This valley was submerged when a dam was constructed and a lake was needed. The lake and thousands of islands were man-made. Shi Cheng ‘defied’ the Chinese norm since 5 gates and 5 towers were built into the city instead of 4. Lion City is about the size of 62 football fields. International archaeologists and a film crew recorded the amazing perservation of the lost ‘ruins.